More on the fire pits: the City has been trying to close them for years and it’s not about money. The City of San Diego has been trying to close or remove the fire pits at the beaches for years. This is the only conclusion I can reach after reviewing a 3 page memo that has crossed my desk that was given to the Peninsula Planning Board way back in May of 2003 – over 6 years ago. The memo is from the San Diego Police Department Western Division and describes a power point presentation to be given to that planning organization that calls for the “Seasonal Removal of the Ocean Beach Fire Rings.” The proposal called for the removal of OB’s fire pits from October 1 to April 30th each year. At the time, I was on the OB Planning Board and now I do recall a similar proposal circulating at our Board as well. I remember at the time that we felt the City and police were trying to remove the pits for good, despite their “seasonal” gameplan. And it’s not about money, either. It wasn’t about money back in 2003. It was because the fire pits were perceived to be the source of pollution and crime in northwest OB. Because this area [the area of the fire rings] is a beach with no addresses for any particular fire ring, we were only able to use commonly known locations to obtain our statistics. In other words, the stats used to prove the problems were caused by the fire rings – or pits – crime numbers were grouped according to the block – not the fire pit itself. We are aware that some incidents begin at the fire rings but the actual crime is committed at a different location. Attempted murder – a victim got into a fight with another male at a fire ring, the victim knocked the suspect down and walked away. The suspect came up behind the victim in the 5000 block of Newport and stabbed the victim in the back. As noted, the memo called for the “seasonal removal” of the pits from October 1 to April 30th. As anyone who has been at the beach knows, it’s still “summer” at the beach in early October and it’s nice and warm usually by the end of April. There’s no talk in the memo about how expensive maintaining the fire pits are. Of course, this was before the huge budget crisis of 2008-09. The City – and the police – have been trying to close down these fire pits for awhile. And it’s not about the money. The money issue is a subterfuge. the firepits are being used as a symbol or metaphor to help persuade the populace that the City’s budget crisis is real, even as they proceed with big ticket items whose only long term benefit will be for the owners of the construction companies (et al), real estate speculators and the politicians that do their bidding. We agree. Removing the fire pits has nothing to do about money. The City and police want to remove an icon of beach culture, the fire pit because the fire pit is viewed as a nuisance. First, no alcohol on the beach, no cigarettes on the beach, – now no fire pits on the beach. Save the fire pits. Don’t let the City remove them. Adopt one instead. This is a story about Mayor Jerry Sander’s relentless pursuit of Uniformity&Control, although the report you alluded to Frank came out before he was elected. I am very reluctant to bandy the word “fascism” around. It is too meaningful of a term to use in a thoughtless, hyperbolic fashion. When I say to you that this is how fascism begins, and takes root, around something as seemingly innocuous as a fire ring, I mean it. Democracy is messy. OB messy. City Heights, where I live, messy. Democracy is the antithesis of Uniformity&Control. Think herding cats. How do you create a willingness to start giving up bits and pieces of our democracy? Create an environment of fear and create an enemy- in this case, the criminal element, the homeless, who lurk around Votaire and Saratoga- ie our own citizenry. Score 1 for fascism. Take away fire rings, and public benches, and all the amenities that make our public spaces meaningful, so that no one wants to be present in those spaces and we become isolated from our fellow citizens. Score 1 for fascism. I have attended public meetings in which the police chief loyally, cheerfully, accepted the cuts the mayor proposed to her department. A good soldier, in a top down hierarchical structure. Get the police/military on the side of the power structure- score 1 for fascism. So far- 3 points for fascism. On the other side- we continue to exercise our right to pursue happiness, which includes fire rings and marshmallow fights and cleaning up the mess afterward and of course our beloved hoopers – 1 point for messy democracy. We continue to talk to each other on this blog, because community is important- 1 point for messy democracy. And we speak truth to power. Always. That is priceless. That has to be worth 2 points. This is just one example of why it was so imortant to the “powers that be” (developers, corporate business interests, etc.) to ram through the “Strong Mayor” form of government. It’s just so-o-o much easier when you have fewer city officials rubber-stamping their agenda. Have you noticed how they don’t allow City workers to comment on anything? City officials won’t talk to the press or answer questions from the public. There is a total lack of tranparency. I agree with AnnaGrace. We have to keep calling them out and demanding that they act in OUR best interests. Score 2 more points for messy democracy! Pat- your observations are on the mark. We all need to make sure that the strong mayor system is voted down this year. I hope this becomes our #1 City issue in the upcoming months. The city used that 1st seasonal removal to reduce the total number of firepits in OB. I’m not sure how many. Were there pits at Dog Beach? Mostly I noticed the loss of pits around Cape May. Larry OB – this memo from May 2003 lists OB as having 10 fire pits in the winter; 2 in Dog Beach; 8 between Dog Beach and Saratoga Park. That’s 10, and then an “increase in the summer time to 16 fire rings”. 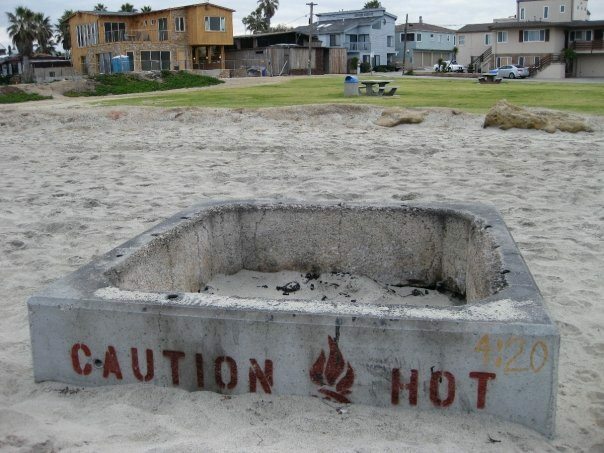 So, as late as summer 03, OB had 10 regular fire pits and another 6 for the summer. But it does count 2 at Dog Beach and our reporter / investigator could not find any. Perhaps they have been moved. No Danny- this is a strong mayor form of government- which BTW we get to weigh in on in 2010. A strong mayor who has said that the budget just adopted on 12/14 is through 2011. Think locally. That is the way we act globally. Who was the Chief of Police in 2003? Your right Anna, Democracy is messy Watching government has often been compared to watching sausage being made. It is painfully apparent as we watch the government debate building a stadium, new city hall or library decide to remove fire pits to “save money” If it wasn’t so sad it would be laughable. I say we burn these fire pits to the ground! Screw it. I’m just gonna make my own very large “personal barbecue”. No booze , no cigs. The beach is becoming enjoyable for a change. tennyson – I just sent you a personal email with details. At this point, all 8 of OB’s fire pits have been “adopted” but we putting new folks on a waiting list, as we will probably be dividing up responsibilities because there has been so much interest. If you wish to get on the list, please be a resident, property owner or business person of OB – or part of a civic group, send us contact info and we’ll be in touch.